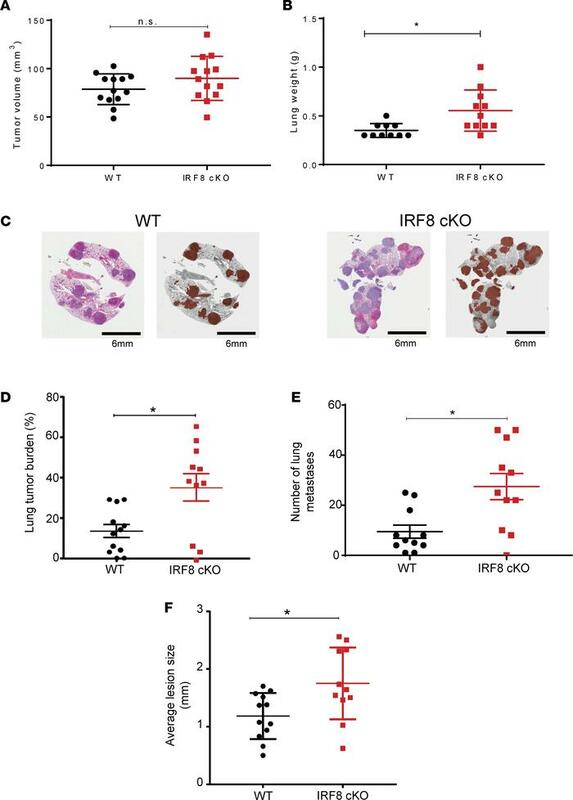 Reduced IRF8 expression in macrophages leads to increased spontaneous lung metastasis after surgical resection of the primary tumor. As in Figure 2, recipient mice were implanted with 4T1 tumor cells and, when the primary tumor volume reached ~100 mm3, it was removed. (A) Mean primary tumor volumes on the day of surgery. (B) Thirty-one to 36 days after surgery, lungs were collected and weighed. (C) Representative photomicrographs of H&E-stained whole lung tissue (left), with a corresponding gray scale image with lung metastases shaded in brown (right). Scale bar: 6 mm. (D–F) Lung metastatic burden in WT vs. IRF8-cKO mice was quantified and reported as percent tumor burden in the lungs (D); quantification of discrete foci (E), similar to Figure 2; and average size of lung lesions (F). H&E-stained slides were analyzed in a blinded-manner for data in D–F. n = 10–11/group in panels A, B, and D–F, and statistical significance was determined by a 2-tailed Mann-Whitney U test. *P < 0.05.